“Jesus, tell them to take their children away–they’re interfering.” (paraphrased, of course). Stop here: this is not a post about why/if people should use birth control. Relax. It’s a probe into our heart’s attitude toward children. Loving comments about children are seldom heard by a family with more than 2 or 3. It’s not people’s use of birth control that bothers me. It’s the assumption that everyone should be using it just because it’s there. It’s the unwelcoming of number 3, as if that child was a sickness or tragedy. And believe me, I know as well as anyone the general consensus. It’s NOT neutral. The above quotes, so commonly spoken, are about “ME.” We mostly (as a culture) make decisions about whether to have a child, or how many to have based on what we want. Will it change our standard of living? What will be best for our reputation? How easy will it be to vacation? Will I get more stretch marks? Can we afford daycare? Will I have to quit my job? Almost always, we think of children as another liability to our lives. Or, occasionally as an asset: whether we can make them into something successful–our trophies, if you will. Either way, we usually look at them in terms of how they will change our lives outwardly. As a mother of almost 8 11, it has finally occurred to me that the children God gives me have so much more to do with revealing Himself to me and making me more fit for His purposes. (Isn’t that God’s plan with everything in our lives? “I am the Potter, you are the clay.”) It’s really not about how cute they look dressed up in white linen, or whether they grow up to play Beethoven well. Those things are wonderful–perks, even, but I believe children are really given to us to change us and make us more like the Giver Himself. There is a lot to smile about. Don’t let the cares of the world dampen the miraculous thrill of creation–a newly discovered caterpillar is worth careful observation. We don’t have to be taught how to sin. We have to practice good habits or the bad ones take over naturally. Sometimes crying just makes it better. Honesty should be tamed before it leaves the mouth. No matter how many times I mess up, my Father still loves me. A regular routine is a very healthy thing. Working is the best recipe for peace and contentment. You can’t have too many Legos. The fewer trips we can make to Wal-Mart, the better. Skin color doesn’t make a difference. Name brands or brand of car doesn’t either. Joyfulness doesn’t depend on my circumstances. Heaven is real and we should be excited about going. Couch cushions on the floor are just as good as amusement parks. Christmas just keeps getting more fun. Every single child is completely unique, a fresh thought of God, and brings a joy to my life I would have otherwise missed. The most important things on earth are the people in my life–and the older I get, the more important they become. Slowly, I’m beginning to really see the Kingdom. As a mom of 8 and grandma of 2 I just want to say that in my experience, what Kelly is sharing here is very important. Children are the challenge that will totally undo you at times, yet they are also the making of us and certainly they bring deep, abiding joy to our lives. And the most lovely thing I can say at this point about the parenting experience, is that when your little ones become young adults, you have these amazingly precious people who are your friends and companions. Yes, it is worth all the times you might want to tear out your hair. A hundred times over, children are worth the effort. Kelly,I wanted to let you know that I have finally gotten one full monthes utility bill sence reading your thrifty thursday post about the family with the $65.00 electric bill and my utility bill has went from $300.00 down to $175.00.All we have done is turned off the lights,and t.v.,until 4 or 5 o’clock and quit useing the dryer.I had grand plans of buying solar lights and turning off the computer but that hasn’t happened yet. I know this is out of place but I was excited to save the money and no one has even missed the lights or t.v.I suppose becoming thrifty might be something learned through having children. Kelly, thank you, thank you and thank you again for this post!!! You are so very, very right. I would love to point the finger and say, “Our world, out there, devalues children” but so often it is me devaluing the very children I would die for: they interfere with my chores, they drain my energy, they need to eat AGAIN, they wake me during the night,etc. When I enjoy mothering the most is when I, by the grace and power of the risen Lord, value and cherish my children as the priceless gifts from the hand of God that they are! Thank you for your affirming words! My soul nods its head in agreement and I can’t help but shout AMEN!!!! Totally agreed! And it’s so true that God uses our children to mold us and shape us into the image of Christ. What a humbling job it is to be a mom!! Kelly, I love this post…I can’t stop reading. You’re right, I guess I am searching for something. Congratulations! Next you should try turning off the hot water before you go to bed, and on again when you need it the next night. We have not gone without hot water (It’s sill hot enough in the morning for breakfast dishes, and a shower or two), though I haven’t seen yet how much we’ve saved. I certainly can’t answer that question, but understand your concern and I believe you and your husband should bring it carefully before the Lord. I will say that I have several friends who have recently given birth to their 6th and 7th babies via c-section, without any complications. Also, several opinions are better than one in the medical field. Thanks so much for your words of added encouragement! There is a lady in our church with 8 children who just gave birth with a 7th c-section. She’s doing great. I will be having my 3rd c-section in September and was wondering the same thing. We do want as many blessings as God will give us. Our Dr. said repeated sections could be a health risk depending on how the scar tissue looks. He said he would be willing to do another one on me if scar tissue is minimal. He said it would all depend on how it looks when he opens me up this time. But if he doesn’t like what he sees, my husband and I want to adopt. Love this blog by the way! Thank you, Kelly and Mrs. W. It’s so encouraging to hear that others have successfully given birth to many little ones via c-section. It’s hard to find big families at all anymore so you’re the resource for my large family related questions 🙂 My feeling is that God created the heavens and the earth; surely, he can restore my womb after each birth so it’s healthy enough to carry and deliver more children 😉 And, Kelly, you’re right, this is something that Hubby and I need to continue to lay before the LORD in prayer; He can give us peace about it. Thank you! What an excellent post! I love the things God teaches us through our children each and every moment. Your site is such a blessing for me and my husband. Thank you! Oh my goodness…28 more days till baby, how exciting!!! I have had 5 children all by c-section.I have had two of the sections five years apart and there was a lot of scare tissue to be removed. My last delivary was an emergency at a regular oppointment durring a ultra sound they could not get my baby to move or respond in any way .My doctor was out of town a diffrent doctor delivard the baby some of my organs had grown together.The doctor put some kind of mesh in to help prevent that from happening again.I asked if I could still have another section and he said I could.He did give me the usual every section posses more of a threat speach.My regular doctor agreed that I could have another section, he said” like I could stop you anyway”.My little girl Mary Sophia was 5 weeks early.There was a very tight not in her cord are second baby to have this happen but she weighed 7# and went home perfectly healthy and a day earlier than any of my other babies.Even the pediatrition told me he could’nt belive she was going home when he new how she was when she came in to be delivard.We have lost 3 babies befor they where born for me that is the hardest part of trusting God to give us as many as he will.It is hard knowing we could lose them. BUT STILL, I TRUST HIM!! Children/motherhood are the common ground where we can meet unbelievers. I can talk about my church, my beliefs, what the Bible talks about etc. but when I mention to an unbeliever that I have a large family I immediately gain a listening ear, especially if the person is in the throes of raising little ones. My children give me a wonderful opening to share where I get my strength and why I “chose” to have so many children. I share that I am not a supermom but God has changed my attitude and heart toward the work of having and raising children and He has to strengthen me daily to persevere in the hard work of parenting! And we can all admit together that it is hard work! BTW Kelly, you are not the mother of “almost eight” children…you are the mother of eight children…you just haven’t met one of them face to face yet:). Kelly I love your list. My children have TAUGHT ME so much in regards to my own character. Thanks for your post. My husband and I are infertile, but we are parents to three beautiful children through adoption. We had thought we’d only wanted one more child (County regulations on our house size, etc. etc. )but He seems to be putting it on our hearts to adopt another sibling group (2), and if one of the kids is young enough we can get a “dispensation” so it would work. I am scared to death, but dh and I are committing to pray about this for a month and then see if this is truly where God is leading us. I just want to make sure I am understanding what you are not saying….you are not saying that the more children you have the More Godly you are? I have two children and for the time being that is all He has blessed me with…I have many friends and family members that have more than two and I feel like they think they are more Godly….which I believe is not true. God is control over all even birth control! Right now God believe my perfect size family is two and maybe Kelly’s is 8 or more? Do you believe God has a set family size? I don’t think so….Yes He has said be fruitful but fruitful could be one or two children and maybe none for some? I believe it is up to God and not us….and as far as birth control goes if He wants you to have a child it will happen! I can not awnser for Kelly but I will say I have a dear friend who has only two children she is now 53. She prayed and prayed for more children.She has never used birth control or fertilite treatments because she believes that you trust God for your family size be it many or few.Yes God can give a child to a person who is useing birth control but God gave us all free will and I would rather choose to trust him than try and prevent a blessing from our loving infinitely wise creater. See my point? I think the issue of birth control needs to be really though through as a couple, held up in the light of what Scripture says about children, and really just considered from a biological stand point. I don’t think you can stop God from blessing you if it is His will…there are many people on birth control that get blessed everyday. I don’t use birth control and he has given me two beautiful children..I would love more only if it is His will. I know a few women that act like they have been overly blessed because they have more children but in truth I am just as blessed! I agree that birth control is not in Gods will! While you are apparently thriving with 8 children, that doesn’t mean it’s good for everyone to have that many. I do think big families can be great, but not for everyone. I know of a family with 5 kids…the parents are drug addicts, the children have been taken away…is birth control a bad idea for them? Not sure where you got your question as it has nothing to do with the post. A drug addict’s problem doesn’t lie in the question of bc or no bc. We’re talking about a sin issue now…one habit of sin leads to all sorts of problems that weren’t meant to be. 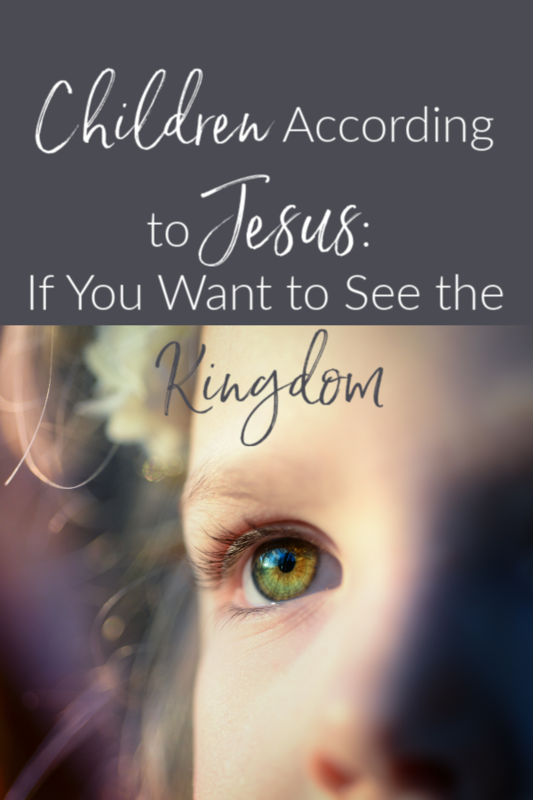 Children might not be a blessing to someone living out of God’s will, so as I talk about the blessing of children, I can really only talk about it within the realm of the Christian life. This post is about what the wide-spread acceptance of bc has done to taint our overall love of children.